Dennis Assanis has been elected UD's next president, and he and wife Eleni discuss the institution. Dennis Assanis has been elected UD's next president. Eleni Assanis and sons Nicholas and Dimitris. A large crowd was on hand at the Trabant University Center for the announcement. 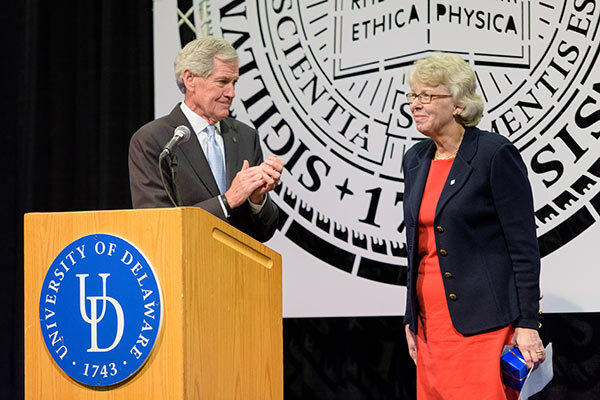 UD Acting President Nancy Targett is recognized by John Cochran, chairman of the Board of Trustees. 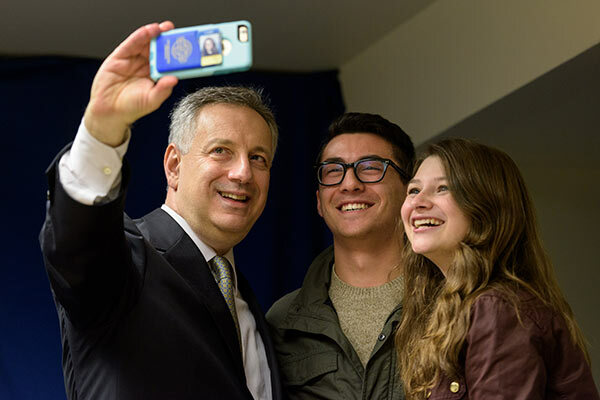 Dennis Assanis takes a selfie after being elected the new president of the University of Delaware. • Colleagues have praised the election of Dennis Assanis as the next president of the University of Delaware. • A photo gallery of events from the Nov. 18 election of Dennis Assanis as UD's next president is available. • Send congratulatory notes to Dennis Assanis at vp-sec@udel.edu. 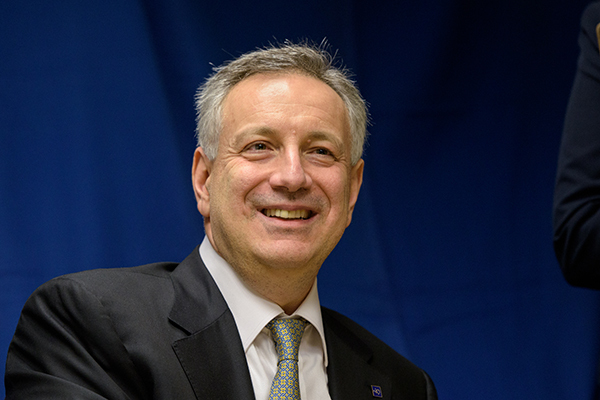 1:17 p.m., Nov. 18, 2015--Dennis Assanis, provost and senior vice president for academic affairs at Stony Brook University, has been elected the next president of the University of Delaware, after a unanimous vote by the Board of Trustees at a special meeting on Nov. 18. Trustees Terri Kelly and Don Puglisi, who co-chaired the Presidential Search Committee, said Assanis was the committee’s unanimous choice. “We were privileged to have a rich pool of top-level candidates for this position. Dennis Assanis’ combination of administrative experience and outstanding academic credentials clearly set him apart,” Kelly said. “Dr. 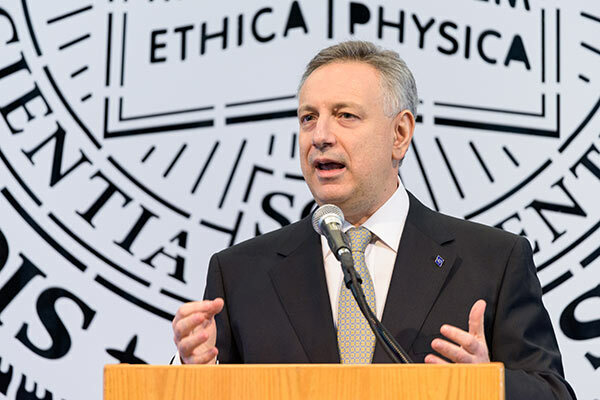 Assanis is deeply concerned with the issues facing higher education today, including affordability, diversity and the future of research innovation,” Puglisi said. "On behalf of Stony Brook University, I extend sincere congratulations to Provost Assanis; we are grateful for his thoughtful and strategic leadership, and for all he has accomplished during his time here," said Samuel L. Stanley Jr., president of Stony Brook. "The University of Delaware is fortunate to have successfully recruited a leader with Dennis' capabilities, and I have no doubt that he will lead UD to continued success." 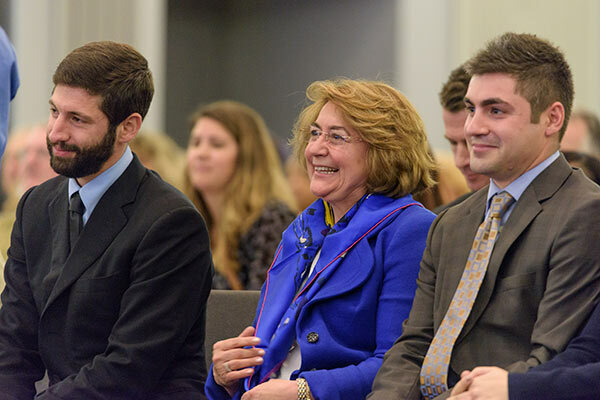 Assanis will take office on July 1, 2016, and Nancy M. Targett will continue to serve as UD’s acting president until then. At the meeting, Targett said, "I am looking forward to supporting the upcoming presidential transition. I will work with the trustees and the UD leadership to ensure that Dennis Assanis is well informed about UD and its many assets – most especially its great people – when he takes office on July 1." Dennis Assanis is a distinguished educator with a wide range of academic leadership experience and a worldwide reputation as a scholar and expert in both fundamental and applied studies of internal combustion engines and energy systems. Since 2011, Assanis has served as provost and senior vice president for academic affairs at Stony Brook University and as vice president for Brookhaven National Laboratory Affairs. At Stony Brook, he has spearheaded the development of a strategic plan for academic affairs and launched a number of initiatives strengthening the faculty, programs for undergraduate and graduate students, research and scholarly activities, and global engagement. He emphasized building on academic excellence. He led the efforts to rejuvenate Stony Brook’s intellectual capital hiring by fostering interdisciplinary faculty cluster hiring initiatives, growing STEM programs to address state and national high-need areas, re-invigorating the role of arts, humanities and social sciences, and strengthening collaborations. He also has worked to enhance student retention and success at Stony Brook. Assanis has intensified efforts to build an inclusive academic community and support for economically disadvantaged and underrepresented students. He significantly enhanced the strategic relationship between Stony Brook and Department of Energy’s Brookhaven National Laboratory (BNL) and played an instrumental role in the leadership that successfully re-competed for the management of BNL. He also led a $20 million fundraising effort at Stony Brook to create an endowed Institute for Advanced Computational Science for interdisciplinary research. Before joining Stony Brook University, Dr. Assanis had a distinguished career at the University of Michigan for 17 years. He was the Jon R. and Beverly S. Holt Professor of Engineering and Arthur F. Thurnau Professor, as well as director of the Michigan Memorial Phoenix Energy Institute, founding director of the U.S.-China Clean Energy Research Center for Clean Vehicles and director of the Walter E. Lay Automotive Laboratory. He has also served as the founding director of the interdisciplinary graduate program in automotive engineering (1996-2002), chair of the Department of Mechanical Engineering (2002-07), director of the Automotive Research Center (2002-09), and founding co-director of the General Motors-University of Michigan Collaborative Research Laboratory for Advanced Engine Systems (2002-11). Assanis started his academic career as an assistant and associate professor at the University of Illinois at Urbana Champaign. Since 2009, Assanis has been honorary president and honorary professor at Zhejiang Automotive Engineering Institute and advisory professor at Shanghai Jiao Tong University. He spearheaded the development of academic programs at the Songdo Global University Campus, thus making Stony Brook the first American University to offer degrees in South Korea. Assanis has an exceptional research record and has been at the leading edge in the field of internal combustion engines, fuels and energy for more than 25 years. He was inducted as a member of the National Academy of Engineers in 2008 for his scientific contributions to improving fuel economy and reducing emissions of internal combustion engines, and for promoting automotive engineering education. He holds five patents and has directed more than $100 million in research grants and contracts. A dedicated teacher and mentor, he has advised more than 60 doctoral students, 150 master’s degree candidates and hundreds of undergraduates. He has introduced innovative teaching methods in his classes and has been a proponent of online education for more than 20 years. Honored with numerous prestigious awards for his teaching and research, Assanis was named SUNY Distinguished Professor earlier this year and is a fellow of the American Association for the Advancement of Science (AAAS), the American Society of Mechanical Engineers (ASME) and the Society of Automotive Engineers (SAE). He has served as editor or editorial board member of various journals. He has also organized and chaired more than 100 national and international conferences, sessions, workshops for professional societies. Assanis earned an honors bachelor of science degree with distinction in marine engineering from Newcastle University in England in 1980 and four degrees from Massachusetts Institute of Technology: a master of science degree in naval architecture and marine engineering and a master of science in mechanical engineering, both in 1982; a master of science in management from the Sloan School of Management in 1986; and a doctorate in power and propulsion in 1985. His wife, Eleni Assanis, is president of a consulting company, Assanis & Associates Inc. They have two adult sons, Nicholas and Dimitris. “My wife, Eleni, and I are looking forward to becoming part of the Blue Hen community and getting to know the students, faculty and staff of UD,” Assanis said. The Board of Trustees appointed a 15-member committee to conduct a national search for the University’s next president after Patrick T. Harker announced his resignation in March to become president and chief executive officer of the Federal Reserve Bank of Philadelphia. 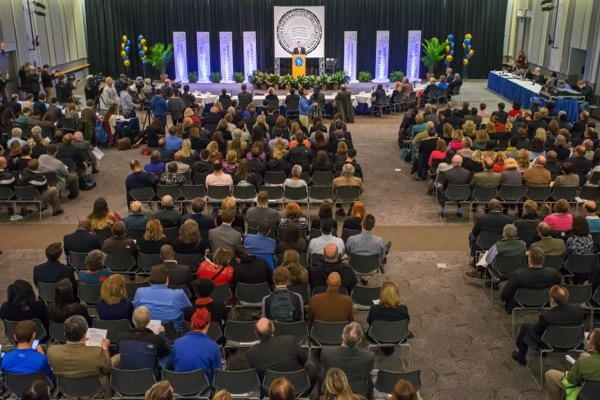 The search committee included representatives from key University constituencies, including the board, faculty, staff, students, parents and alumni. Through open forums, focus groups and one-on-one meetings, the committee collected extensive feedback from campus and community stakeholders on the key priorities and challenges facing the incoming president, as well as the competencies and experiences central to any successful candidate. After reviewing the qualifications of more than 50 candidates, the committee conducted in-depth interviews with a small number of finalists. Assanis was the search committee’s unanimous recommendation.